Here in the Netherlands we’re celebrating National Seed Day on 22 April. And as both lovers of the environment and members of The Pollinators’ National Zaaicoalitie (seed coalition), Paper on the Rocks will be posting out packets of flower seeds with all your orders from 11 April. This way, we hope to encourage you to grow your own little flower paradise to support bees and to make your own personal contribution to increasing biodiversity in your local area. We spoke to Marjolein Moeijes, project manager at The Pollinators, to find out more about this awesome organisation, and their upcoming campaign. Hi Marjolein! Can you tell a little bit about The Pollinators, why you got started, and why we should be interested in what you do? 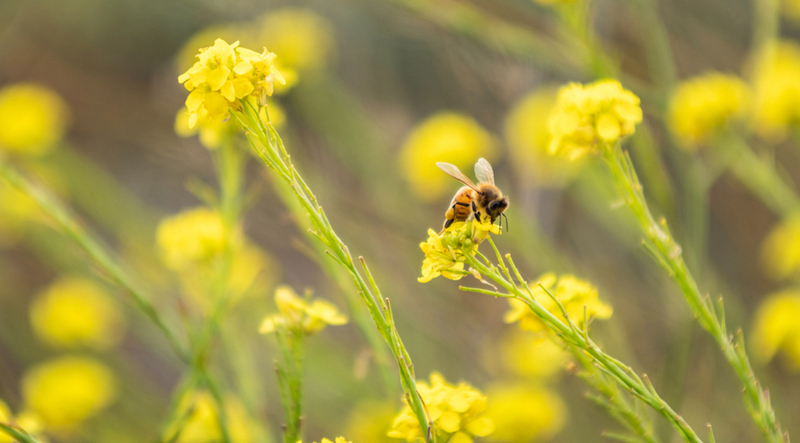 As most of us know now, bees and other pollinating species play a tremendously important role in our ecosystems. Without them we would have a lot less variation in our landscapes and our food supply. Currently many pollinating species are on the red list of endangered species. That has to stop! And that’s why we started The Pollinators in November 2016. It’s a continuation of the work our founder Tom had already been doing with bees since 2010. Turn ideas and ‘likes’ into action, so that a real positive, impact will be made. It sounds wonderful – and like there’s lots of important work to be done. What do you personally do at The Pollinators? As a project manager I am responsible for the overall organisation of National Seed Planting Day. I’m also in charge of our volunteer programme and building our offline community. And what does Paper on the Rocks have to do with The Pollinators’ work? We believe that it’s everyone’s responsibility to treat our environment in the best way possible, since we depend on it – and not the other way around. Can you tell us a bit more about your exciting upcoming campaign? We’re launching the biggest seed-sowing campaign in the Netherlands. We’re bringing together citizens, companies, and institutions to get active, put their hands in the earth and plant Marjolein Moeijes, flower seeds which are good for pollinating insects. The big day is Monday 22 April – Earth Day. Five-hundred people have already signed up to be ‘food banks for bees’ – a distribution point for local people to collect flower seeds. You can pick up yours during the week leading up to 22 April. Find your nearest food bank for bees. And what can we all do to get involved? Spread the word and spread the seeds! Collect your packet from your nearest food bank, and invite others to do the same. Communicate and make sure everyone knows about this! Finally, what are your hopes and dreams for the future? The Pollinators hope to establish a global platform, connecting people all over the world who share our vision and mission. In the end, our aim is to transform the food production system. We demand pesticide-free, biodiverse polyculture agriculture, preferably community-based, as opposed to the large-scale agriculture we have now. We also want to cover the planet with trees and food forests! That sounds great – and we are so happy to be part of the seed coalition this year! All orders placed with Paper on the Rocks from mid April 2019, and while stocks last, will include a packet of seeds from The Pollinators. Make sure you share your seedling pictures with us @paperontherocks and @the_pollinators! Photo by Clyde He on Unsplash.